William Crolly was born at Ballykilbeg, near Downpatrick on 8 June, 1780 He attended a classical school in Downpatrick, conducted by Rev. Mr. Nelson, a Unitarian minister. He went to Maynooth in 1901 obtaining first place in dogmatic theology in 1806 and in the same year he was ordained priest. For six years he lectured in logic, metaphysics, and ethics and in 1812 moved to the parish of Belfast, which covered the entire town and a district some thirty miles across. 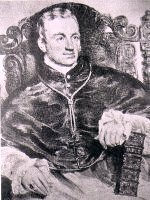 He was appointed Bishop of Down and Connor in 1825 and persuaded the Vatican to change the episcopal parish from Downpatrick to Belfast. While there he built a large church in almost every parish, and founded St. Malachy's College. Due to the shortage of Catholic schools, Dr. Crolly was obliged to allow Catholic children to attend Protestant schools, a course of action that caused a fierce controversy after his death. In 1835 he was appointed to the archdiocese of Armagh where in 1838 he founded St. Patrick's College. When the question of the Queen's colleges arose, the primate was one of those bishops who looked favourably on the project. The proposal was however formally condemned by the Vatican. His great work however, was the foundation of Armagh cathedral, which was not completed till twenty-four years after his death. Construction went steadily on until the famine stopped progress. Dr. Crolly died in Drogheda of the cholera on 6 April 1849, and was buried in the centre of the choir of the then unfinished cathedral.